Minf0rd’s Makenzie Watters finished with a team high 13 points in the Falcons road loss to Oak Hill on Thursday. 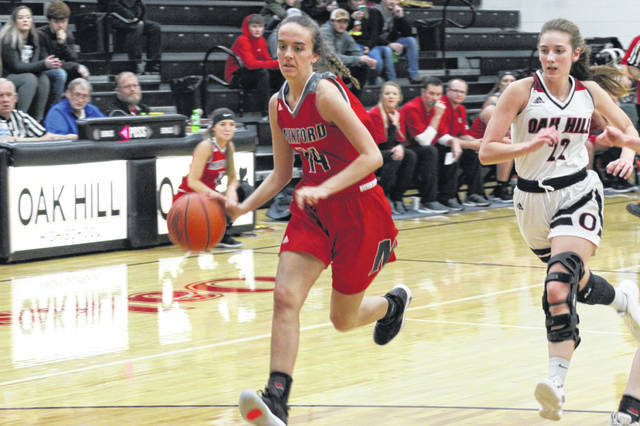 OAK HILL – The Minford Falcons (10-4, 7-3 SOC II) fell two games behind in the SOC II conference race following their road loss to Oak Hill (12-2, 8-2 SOC II) on the Lady Oaks home court Thursday night, 46-44. Down by two, Minford’s Maddie Slusher found herself at the line with the chance to tie the game if she sunk both shots. The first one fell, the second did not, and the Falcons fell at the hands of the Oaks by two following Oak Hill sealing the game from the foul line. The Falcons led for the first two and a half quarters on Thursday night in a tough road environment, but once the Oaks made their run to take the lead, they would never look back. Minford did a good job defensively on the Oaks, particularly in the first half when the Falcons limited their offensive production to just four first quarter points, and 15 points heading into the locker room at intermission. The leading scorer for the Falcons on Thursday night was Makenzie Watters with a team high 13 points coming off the bench. When Watters entered the game, her team trailed 4-3. Just like that, Watters made a free throw and hit two big threes to extend their lead to 10-4 in the blink of an eye. Following losses to Division II Miami Trace on Monday and Oak Hill on Thursday, Minford will have a non-conference game vs. the OVC’s Coal Grove on Saturday at Fairland HS. Oak Hill will travel to Alexander on Monday for a non-conference contest in their next game.